I just watched “Bombshell,” on Netflix. It’s about the life of Hedy Lamarr, the actress I always maintained was the most beautiful one of all. It turns out that she possessed a discerning, scientific mind. For instance, during WWII, she invented a communications system that today’s WIFI is based on. But always, her breath-taking beauty got in the way of people taking her intellectual mind seriously. All sorts of judgments and assumptions are made about people who are good looking. In the cinema, beautiful people are usually depicted as conniving and underhanded. With an air of superiority, they manipulate people to gain advantage. The beautiful woman is often shown gazing fondly at herself in a mirror. While admiring herself as she primps, she plans the details of her next conquest. What kind of role-model is this? Beauty and intellect are accidents of one’s genes. The same doors that opened because of Hedy Lamarr’s beauty, also imprisoned her in a narrower definition of who she was. But she accepted her beauty and all it brought. In my experience, being fair to look at has not opened any doors. That’s probably because, unlike Hedy, I’ve always been ill-at-ease with being attractive. My looks seemed always to target me for unwanted aggressive advances, often putting me in danger (boundary and abuse issues). I never flaunted my looks and seldom went out in public alone. I took pains to be nice and unassuming, but insecure girl friends or wives still considered me a threat. Jealousy made them regard me with suspicion and they made me feel unwelcome in their company. I mostly kept to myself, or huddled underneath the protective arm of a boy friend and later, husband. Professionally, I did not fare much better. As an artist, it’s always challenging to find work, but if I landed a good freelance job, it must have been because I had slept around. Untrue stories questioning my morality cropped up that were very hurtful. The meanness of the gossip really got to me. What had I ever done to deserve the treatment I received in my younger, socially awkward days? As a consequence, I retreated and spent my life hidden away as an introvert. I covered myself in frumpy, oversized clothes, and wore baggy sweaters. I did not embellish. I used no make-up. I covered my body like I was apologizing for my existence. I totally hid my radiance, my beauty, my light. Never again do I want to be a victim of lust, jealousy or lies by people who cannot take responsibility for their own feelings, who claim it’s my fault for making them feel whatever they feel. The only time I felt safe enough to dress up, look great, be radiant and dance in public was within the company of my husband. Now it’s 2018. I realize I have never owned my beauty. Now that age has given me wrinkles and whitening hair, with gravity tugging my less-resilient skin, it’s time I take a look in the mirror to have a peek at the truth. What has my all-natural, tattered jeans, baggy sweater, no-make-up style ever done for me (besides saving me an ton in cosmetic and clothing costs)? I now perceive, the “all natural” hippie persona I chose to embrace has just been another way of remaining invisible. I’ve been using it as a shield, of playing small, and not owning the spotlight. To achieve my soul’s purpose, Spirit needs me to actively embrace my totality. I’ve always been quite willing to look at the negative aspects of myself, but beauty… not so much. Now, it’s time to take the next step, even if that step means to jump into the fire. Jumping into the fire — I suddenly know what that means — to have the courage to face something that truly terrifies me! My fear of being seen makes me camera shy and explains my reluctance to video record myself. (My gosh — people will actually see me…) Video pod-casting is my next hurdle. To totally embrace my feminine self means to acknowledge my natural beauty and all that entails. That would automatically make it impossible to remain unseen. It’s an odyssey. As I’m writing, I suddenly realize it’s a little before noon on the summer solstice. Maybe these words have more significance than I thought. Thus, my challenge becomes my gift. This entry was posted in Life As Art and tagged Beauty, bomb-shell, brains, feminine, Hedy Lamarr on July 2, 2018 by Darlene. 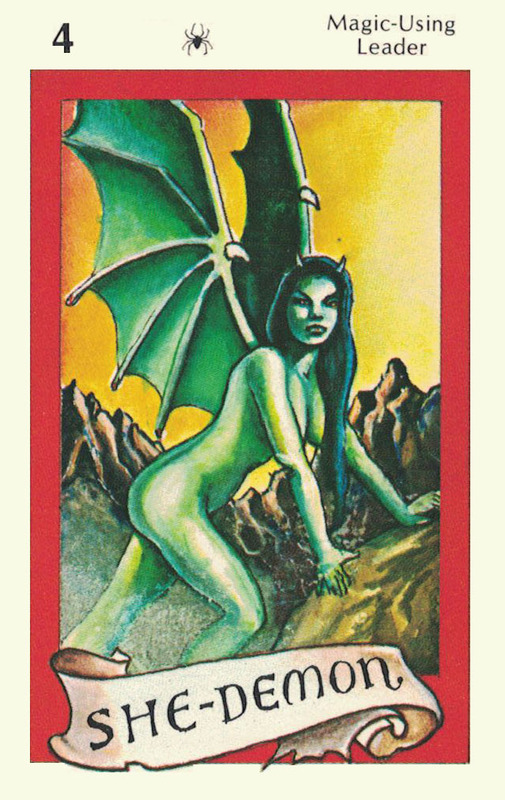 Four cards from JASMINE: The Battle for the Mid-Realm Collector Card Game. “Cheating? Tests? What? You tested me?” Jasmine asked. “What were these tests?” Jasmine asked. The West Wind blew, a cold blast of fury at Ost, who quickly pushed himself away. Wein followed. Both took the forms of nasty, fast-moving, funnel-shaped spirals. Right after Wein’s blast of frigid air circled Jasmine, another energetic blast knocked her off her feet, as Noird left to join the windy fray. Out in the dense forest, two mighty winds chased and abutted each other in the form of tornados, wreaking havoc on the local weather and on the land below. In their beds, the people below crouched in fear. They will long remember the terrible winds that visited them on this day. Sud suspended Jasmine from her fall and pushed her gently back to her feet. “Ost and I believe you have passed all of our tests,” she said, sweetly. “And everyone knows Ost will win. He’s the strongest at the moment. I would guess they are putting on a show for you, my dear.” She mused. “Why would they do that?” Jasmine asked. Become a PATRON to Continue the story. This entry was posted in Jasmine & Role Playing Games, The Creative Process and tagged Aria, Faery, Faery Realm, Noird, Ost, Sud, The Four Winds, The Ring of Emeth, Wein on May 23, 2018 by Darlene. 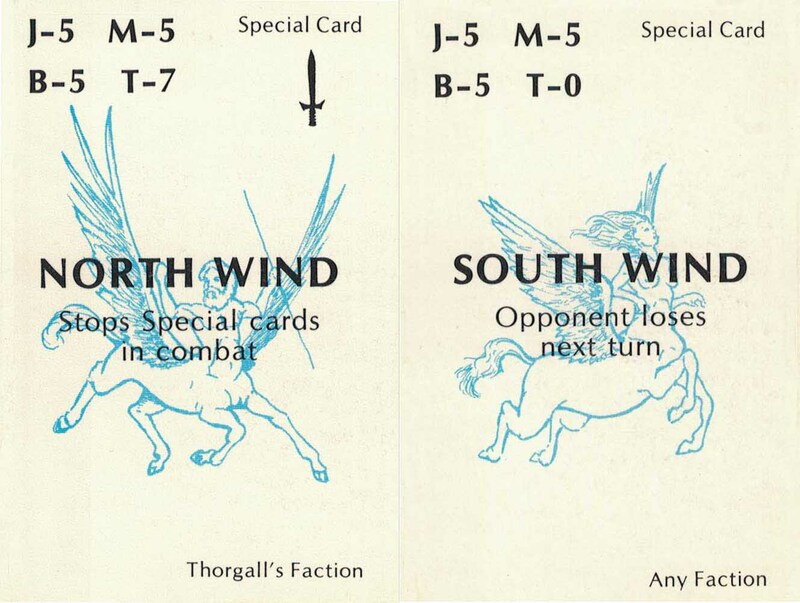 The North and South Wind cards from JASMINE: The Battle for the Mid-Realm Collector Card Game. 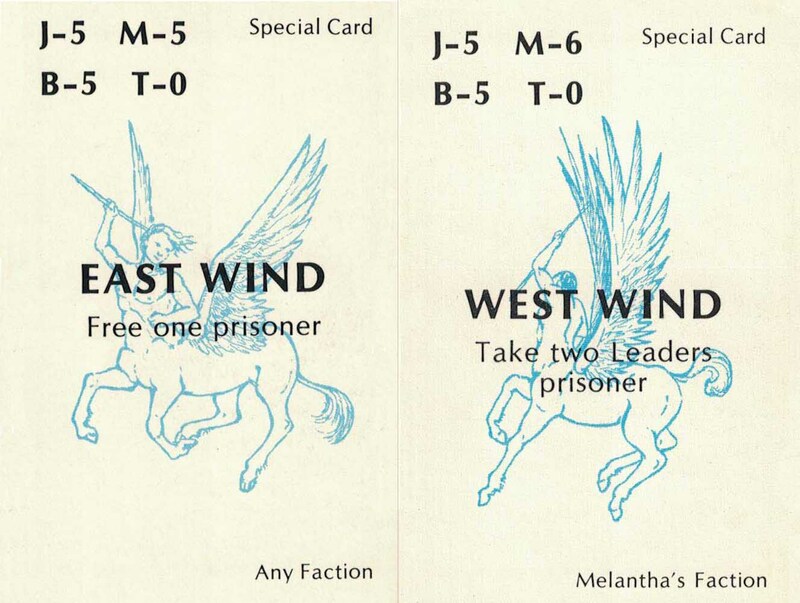 Two Wind Special Cards from “The Battle for the Mid-Realm” collector card game. Jasmine looked down at her hand and inspected the ring. So, it’s not a ring after all, it was a Faery King’s Crown. How strange. Then she looked up at the brilliant luminescence of the sky. It seemed to her there were only deep, saturated colors. There was no blackness in the night sky at all. “Where am I?” she marveled. A Wind came up from behind and blew her hair forward. The Wind answered, “Welcome to the Meeting Place of the Winds. Allow me to introduce everyone. I am Ost, the East Wind.” He spun around delightfully as he spoke, “I am the first wind–the breeze of the morning. As herald of the day, I bring hope and brightness.” He stopped and moved closer to her and whispered, “At the moment, I am the strongest here as it is just about to dawn.” Ost landed lightly by Jasmine’s side and took Jasmine’s hand. She clearly felt Ost’s firm grasp and wondered how this could be. Ost introduced her to the other three winds. Each one’s sharp, undulating features refracted in and out of invisibility. Ost paused. “This is Wein, the West Wind.” he introduced, “He shall be the strongest wind this afternoon.” Next to Ost’s warm feel, Wein was cold. He seemed bluer than the other winds and his voice had an unfriendly edge to it. “I shall chill you and never leave you in peace.” Wein said. “Lovely.” Jasmine sighed a bit too loudly. Noird blew a kiss at her. “I sincerely hope you will be around when I am able to serve you…” Jasmine blushed, then acknowledged him with a nod of her head. Ost took her to meet the last wind, “Sud is the hot wind of the night. Her strength envelopes and protects.” Sud displayed more of a purplish cast. Her vibration seemed faster than the other winds. Strangely, the faster undulations gave Sud’s sharp features more definition. With Sud’s form, she could make out a body beyond her face. From what Jasmine could tell, Sud had the general shape of a horse with great wings, but also, instead of a horse’s head, there was a woman’s torso. Jasmine thought Sud looked exquisite and stunning. “Oh.” Jasmine said, “thank you.” It seemed to Jasmine that Sud winked at her and she chuckled. This entry was posted in Jasmine & Role Playing Games, The Creative Process and tagged Jasmine, Meeting Place of the Winds, night, Noird, North Wind, Ost, South Wind, Sud, The Story of Jasmine, Wein on May 22, 2018 by Darlene.